While working on my just-released bibliography of John Stanley's 1940s comic book work, I gave every non-Little Lulu Stanley story from that decade another look. I re-appraised a couple of pieces I had previously passed by. 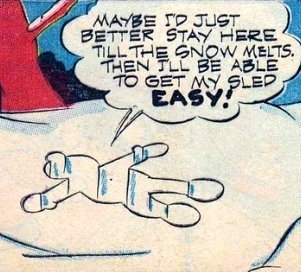 That they share a plot theme--a kid's desire to go toboggan-riding--struck me as more... than... coincidence... Thus, these two stories comprise today's post. I've written before about Stanley's comedic archetypes. None are stronger, nor more present throughout his work, than the character I call "the Tubby type." This character is a Rosetta stone for determining whether an obscure story is--or isn't--John Stanley's work. This archetype's mulish determination, blended with rose-colored self-regard, allows him/her to fearlessly step forward into scenarios of potential humiliation, ostracization and belittlement. Blinded by their usually flawed assumption that they're unerringly right, Stanley's Tubbies typically succeed. Not without some emotional scars, but they do win in the end. Their victories are relevant to our daily lives. We seldom outright win, or outright lose, in personal events with high stakes. It's usually a muddled mix of the two. This, too, is the "win" scenario for Stanley's Tubbies. Their societal rewards, always fleeting, exist just long enough to further convince these Tubbies that they're on the right track. Their stubbornness is often the agent of success. A brief diversion: notable comics predecessors to Stanley's "Tubby Type" are the richly detailed characters of Major Hoople and Judge Puffle, from Gene Ahern's long-running features Our Boarding House and Room and Board. I've come to wonder if Ahern was an influence on John Stanley as a comedic writer. The two share a bent for dryly absurd humor. Both also excel at escalation-comedy which always ricochets off the quirks and shortcomings of their eccentric characters. Ahern, if anything, was comics' closest equivalent to the comedic vision of W. C. Fields. Both men shared a penchant for quirky domestic humor--tempered with unexpected doses of the surreal/absurd. As well, both Ahern and Fields wasted no time making their focus figures likable or heroic. Stanley shows us the errant sides of his Tubby Types--indeed, that's the most interesting thing he sees in them. They suffer ridicule, but are tolerated, if not adored, by their more stable companions. Ahern's Quixotic figures suffer a far worse fate than Stanley's. They are openly mocked by friends and family. They consider themselves learned men of the world, but are clearly regarded, at best, as dubious company by their neighbors and acquaintances. What might be heartbreaking theater-of-cruelty humor is salved, in Ahern's work, by these characters' unerring self-belief. Here is the third in a series of rare early John Stanley stories scanned for our enjoyment by Michael Barrier, who kindly helped me complete my archive of Stanley stories with his brave efforts. This is a significant story in Stanley's career. For the first time, we see him really getting his act together as a writer of narratives that have humor, character and stakes. From this moment on, John Stanley's work routinely combines these three important agents. His stories have a clear narrative arc, laced with conflicts, escalations and a denouement that ties everything together with skill and wit. Perhaps it was the added assignment of "Woody Woodpecker" that spurred Stanley into a higher bracket of comics storytelling. Certainly, the 'pecker offered him his first really forceful, wild-card pawn for the comics chessboard. He clearly needed a playful, edgy figure to push him past the kiddie doldrums that might otherwise have suffocated his earliest work. 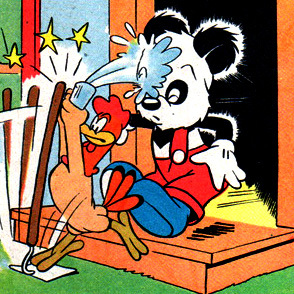 This story features Stanley's first original comics creation (in his 10th appearance), Charlie Chicken. Charlie is Stanley's first wild-card. Stanley didn't know what to do with him until around this time. He clearly was needed, to enliven the otherwise dull doings of the namby-pamby panda.